A range of bracken control methods exist but those that involve vehicles of any types can of course only be deployed upon land that is both fairly even and level (or only shallow sloping) otherwise severe safety issues will be encountered. Control methods will include ploughing/rotovating (most effective but have environmental and soil erosion issues), crushing/crimping/cutting (not too effective unless carried out 2 – 3 times a year over many years) – cutting probably best of these options as the flails generally used will also destroy the matt of bracken litter). The spraying of Asulox can be extremely effective if carried out correctly and at the right time (mid-July to mid-August for most areas, although good kill rates may be attained in Scotland and North of England until well into September). Tractors, argocat type machines, and quad bikes can all achieve good results. Use of a weedwiper can also be engaged but the land has to be fairly even and the results are often patchy. However, much of the bracken land that can be safely driven over has already been treated, which leaves only two other means available for dealing with the more seriously sloping ground. By hand – e.g. scything, strimming, knapsack/ulva spraying. These methods usually produce very patchy or variable results, and are arduous and also expose the operators to a number of risks – inadvisable, bearing in mind the remoteness of most of the target areas. In addition, the work rate is far too slow (one hectare per day would be as much as one person could achieve and only that if travelling time was minimal). By helicopter spraying – this is arguably the only methodology that is capable of delivering both the level of effectiveness required (an initial kill rate of 98 – 99% is often achieved) and the work rate needed to cope with the scale of the bracken problem. Bracken being sprayed on a remote mid Wales mountain pasture. 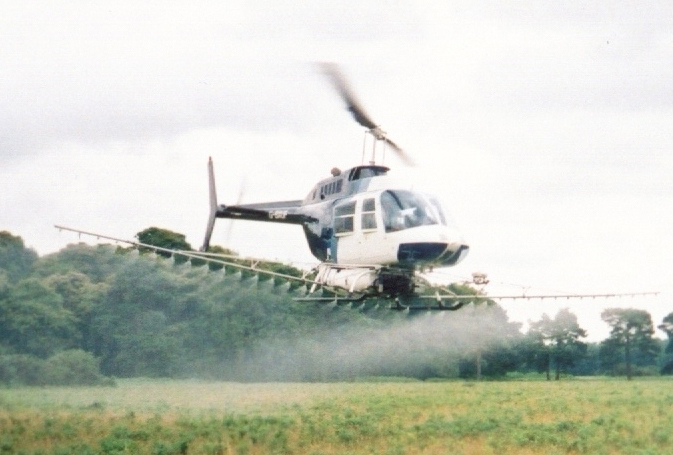 The aerial spraying of Asulox has been carried out (safely) for over 40 years and exhibits the following benefits. Environmental disruption is minimal as there is no ground or species trampling and the exhaust emissions (carbon footprint) is so low. A jet turbine helicopter will spray the equivalent of the entire day’s work-output of a tractor (i.e. 30 – 40 acres) in 25 minutes engine running time, and the turbine engine burns more cleanly and efficiently than the tractor engine. 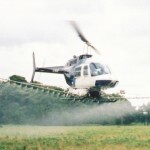 Aerial application chemicals and the actual applications are more strictly controlled than for ground spraying and only those agro-chemicals possessing aerial application clearance (such as Asulox) can be used. Fortunately, Asulox also happens to be one of the most effective products for clearing bracken and further, has the benefit of being quite target specific as well as no discernible levels of toxicity to mammals (including man), insects (including bees) and fish. Timeliness – the ‘window of opportunity’, as far as M D Air Services is concerned, runs from mid July to mid August. (After this point the kill rates tend to fall off in many parts of Wales.) 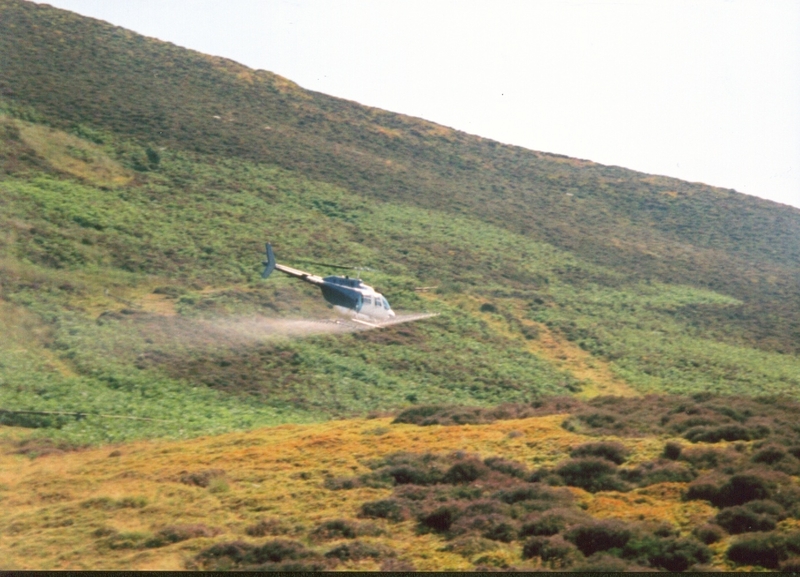 Because of the helicopter’s rate of work, we have little difficulty in completing our entire bracken spraying programme - in spite of the poor weather in recent summers; this could not be achieved by any other means. The rapid rate of work can result in as much as 500 acres (plus) being sprayed on some days, although 150 – 250 is more the norm. Flexibility - the helicopter can treat bracken virtually anywhere that meets the legal requirements. Note:- economic viability issues need to be considered when the spraying of small and diffuse areas of bracken are being contemplated. 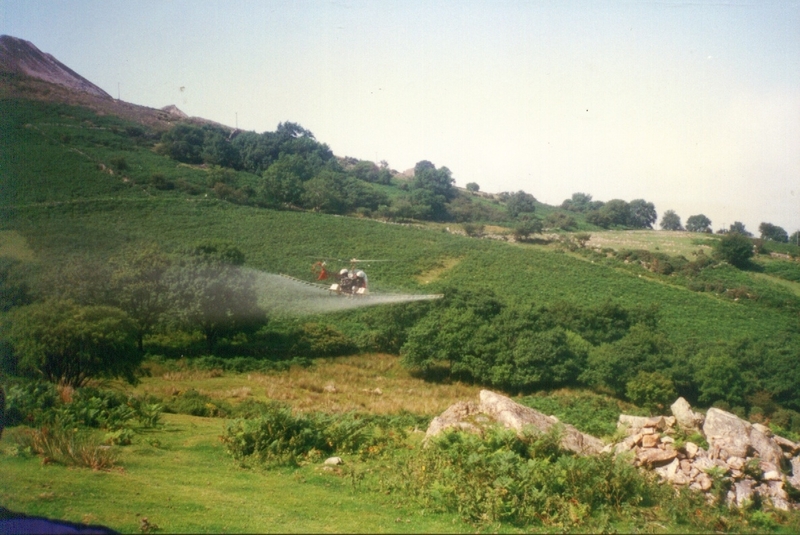 Operator safety – although not without some level of risk, flying the helicopter over sloping bracken land is clearly somewhat safer than trying to drive a tractor or quad bike over/across such slopes (as HSE accident reports clearly show) or having some unfortunate individual trudging out over the hostile terrain with a heavy knapsack sprayer on his back. Inevitably an unseen rock or hole will bring about a tumble, and if a limb is broken this could be a most serious matter in such remote areas. Further, the knapsack operator (and perhaps even the tractor or quad bike driver) may be at risk from the clouds of bracken spores that will be naturally discharged in some years (disturbance caused by the work will of course aggravate this problem). View depicting the wild and remote terrain where much of today’s bracken lies – generally only accessible to grazing livestock and sheep dogs!